I have been out of school for over 2 years now and I still have $--,--- amount of student loan debt that still needs to be paid off. I had to take out student loans to pay for tuition, housing, textbooks, supplies, groceries, and gas. Yes I had a job but that merely paid for utilities for my apartment. I was recently contacted by CampusBookRentals.com and they told me about what they have to offer. I was kicking myself in the you know where when I read about their textbook rental policy. Now let's start at the beginning. If you are a student or if you can remember way back when you were in school, the ridiculous cost of textbooks. You went to the school store and tried to find used textbooks that did not look like a dog enjoyed part of it as an appetizer or one that was not washed in the washing machine. But if you couldn't find a decent looking used book, you had to fork over your cold hard cash or student loans to buy a book that you might read one chapter out of. This is when you have a daily argument with yourself about if you should or should not write or highlight in that brand new textbook. After all, you do want to try and sell the book back to the school at the end of the semester in hopes of getting 1% of what you paid. We have finally welcomed ourselves into 2013 where you can just rent your textbooks. That is right, rent away. At CampusBookRentals.com, you get free shipping both ways, you can highlight in your textbooks, you will pay 40-90% less than at the school store, and best of all, they donate to Operation Smile with each textbook rented. Now you know I love a great company that also donates to fantastic charities. Here is a bit of a breakdown. I still have a few of my textbooks because they were not worth selling back to the school or even to Amazon. Trail Guide to the Body I remember being about $120 when I bought it and because it was a workbook the school would not buy it back. 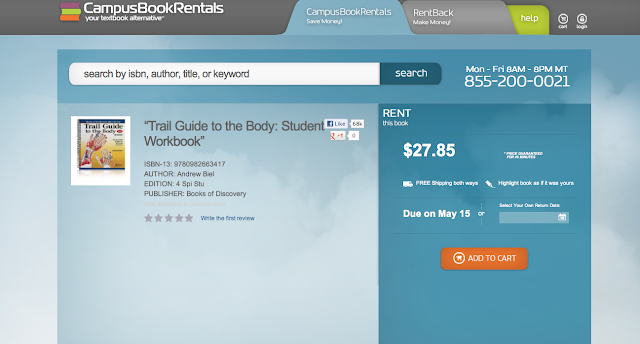 Now of course there is a new edition that schools are probably using but if you wanted to rent it from CampusBookRentals.com, then you are only paying $27.85 for the semester. Best part, you return it back even if you were to highlight and write in it. Go see how it works for yourself. *This is a sponsored post but all views and opinions are of my own. Shanna @ Because Shanna Said So for Random Wednesdays. I've gotten all my books through Campus Book Rentals since starting grad school. Oh, if only it existed when I was an undergrad! This sounds so awesome! Do you know if this is just for the US? Wow! I just did a quick browse and they even have law books! Those $%^& books are a huge part of my student loan balance.